This article was originally published in February of 2015. It comes to us from the University of Nebraska Lincoln’s Beef website. Thanks to Dr. Rick Rasby for his excellent explanations! Be sure to scroll down to the bottom and check out the app that UNL created to help you practice your body condition scoring and to photograph and store information on individual animals. The body condition score of your cow herd is a much better indicator of the effectiveness of the nutrition program than body weight of the cows or average weight of the cow herd. Body condition scores (BCS) describe the relative fatness or body condition of a cow herd through the use of a nine-point scale. A body condition score five (BCS 5) cow is in average flesh and represents a logical target for most cow herds. A BCS 1 cow is extremely thin while a BCS 9 cow is extremely fat and obese. Body condition score (BCS) of beef cows at the time of calving has the greatest impact on subsequent rebreeding performance (Table 1). The postpartum interval is the length of time from calving to first estrus (heat) after calving. For a cow to maintain a 365 day calving interval, she must rebreed by 82 days after calving (283 day gestation + 82 day postpartum interval = 365 days). On the average, cows that calve in a BCS 3 or 4 have difficulty exhibiting their first heat by 80 days after calving. Whereas cows that calve in BCS 5 or 6 tend to exhibit heat by 55 days after calving and; therefore, have a better opportunity to maintain a 365 day calving interval. Although cows that calve in a BCS of 7 have a short postpartum interval, it is not economical to feed cows to a condition score of 7. Body condition of March calving cows can be related to quality of colostrum produced at calving and the amount of immunoglobulin in the blood stream of the calf by 24 hours after calving. Calves from dams that calve in a body condition score of 5 have more immunoglobulin in their blood stream by 24 hours after birth as compared to calves from cows that calve in a lower body condition score. In addition, March calving mature cows that calve in a body condition score of 5 have a shorter interval from calving to their first estrus after calving compared to cows that calve in a lower body condition score. Thin cows at calving (BCS 4 or thinner) produce less colostrum, give birth to less vigorous calves that are slower to stand and these calves have lower immunoglobulin levels (Figure 1), thus impairing their ability to overcome early calf-hood disease challenges. This illustrates the importance of targeting mature cows to calve in a BCS of at least 5. Because 1st-calf-heifers have only reached about 85% of their mature weight after calving and require additional nutrients to support growth, they need to be fed so they are a BCS of 6 at calving. Body condition scoring can be done using only visual indicators or a combination of visual and palpation of key bone structures for fat cover. Palpation can be done during routine processing of cows through a chute. The key areas for evaluation are the backbone, ribs, hips, pinbones, tailhead, and brisket. Palpating cows for fatness along the backbone, ribs, and tailhead will help refine your skill to visually access body condition. If body condition scoring is new to you, just focus on separating cows into thin, moderate, and fat groups without worrying about the numerical score. With experience, you will connect the ”look and feel” of your cows to a body condition score that you can consistently determine. Body condition scores should be recorded so that links to productivity and herd management (particularly nutritional management) can be examined. Several years of such information could reveal, for example, needed management changes for a given age group (i.e., thin three-year-olds) of cows or might identify a sire group of females that simply didn’t fit your resources. When visually scoring body condition, you must “look through the hair coat”. Sometimes this is difficult due to a long winter hair coat. It is good training to re-evaluate your body condition scores when cattle are wet. You may be surprised at the impact hair coats can have on visual scores. Long, thick winter hair coats are obviously highly desirable (at least in the Northern plains), thus actual palpation for fatness of cows may be the best choice to produce consistent body condition scoring. Drawings of cows in BCS 1 to 9 can give an indication of how these cows would look if they were without hair. Other factors in addition to hair coat that can affect visual body condition scores are age of cow, rumen fill, and stage of pregnancy. The goal of body condition scoring is to evaluate fatness independent of these factors. At first, one or more of the above factors may mislead you, but careful study of your herd through the production year will sharpen your focus so that body condition can be scored independent of the above factors. The same techniques are used to condition score cattle that have Bos Indicus genetics. Depending on the percentage of Bos Indicus genetics, the skin appears to be wrinkled or folded. Determine degree of condition at the same locations and assign a score based on the 1 to 9 scale. The greatest single factor influencing rebreeding performance of beef cows is body condition at calving, especially for spring-calving females. However, if producers wait until calving to manage body condition of their cows, they will find it very difficult and expensive to increase the body condition of a lactating cow. This is an important time to condition score cows in drought years or in systems where females are managed almost entirely on vegetative or dormant grazed forage. If cows are thin, early weaning should be considered. Non-lactating cows may pick-up condition by grazing forage alone or by feeding a small amount of supplement along with the grazed forage. If young cows are thin and grass in the pasture is decreasing in nutrient quality, strategically wean calves. Pay particular attention to young cows weaning their first calves, as they are most likely to be thin at this time. For young cows, you may need to consider early weaning calves and giving cows access to higher quality forage. This will give you a good idea how fast cows are “bouncing back” after weaning. Thin cows should be gaining back condition if cow type is matched with the feed resources. This is the last opportunity to get condition back on cows economically. This would be the time to separate thin cows from cows in good condition. 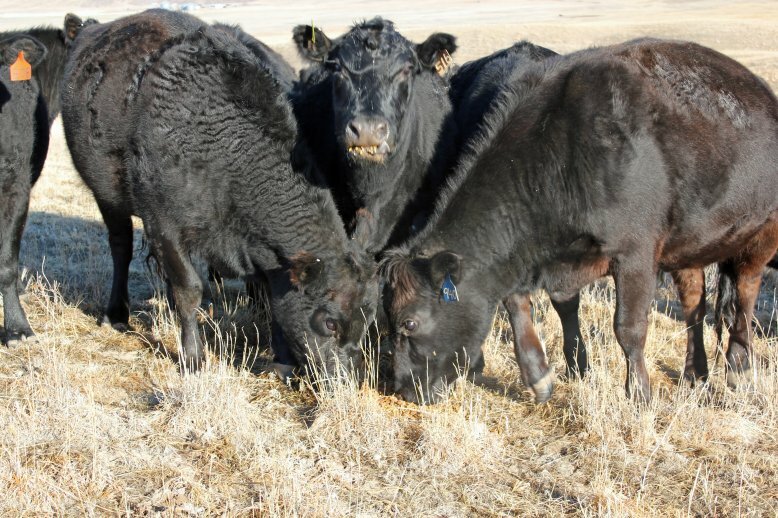 If cows are thin, producers may want to change the pre-calving feeding program. Because of the nutritional demands of lactation, it is difficult to get cows to condition economically after calving. Thin cows at this time may indicate a poor match of calving season to feed sources. Maybe calving occurs too early in the spring. The period from weaning to 90 days pre-calving is the best time to get serious about body condition scoring and planning the nutrition/management program because the manager’s strategy can have great impact. The period from calving to re-breeding may help explain the productivity (or lack thereof!) but it is likely too late to have much impact on herd productivity and profitability at this point. If cows are thin management options include early weaning when the youngest calf is 45 days old or 48 hour calf separation. Both of these management techniques will help initiate estrous cycles in beef cows. The NUBeef-BCS app allows you to visually assess your cow herd and nutrition program using a number system that describes the amount of condition or fat reserve of the cow. When using the NUBeef-BCS app, producers can simply take photos of their beef cows and then score cows at important times throughout the year, such as at weaning, 80 days before the start of calving, at calving, and before the start of the breeding season. Photos and body condition assessments can be recorded throughout the year because the app allows for pictures at multiple times throughout the year. There is also a guide in the app to help the user condition score their herd. Here’s a 1:49 minute video about what you’ll find in the app. NUBeef-BCS may be purchased and downloaded from Google Play and Apple App iStore. Tablet readers, here’s your link! Fences and Management-intensive Grazing – Why Bother?